DawnNews: Obama calls Iran protests sign election results "raised a lot of doubts"
WASHINGTON (CNN) -- President Barack Obama told a Pakistani television outlet that isolating extremists is crucial for improving ties between Muslim nations and the United States. 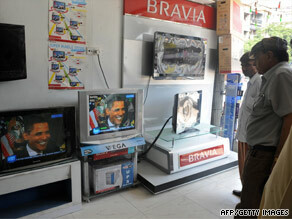 Pakistanis in Karachi Sunday watch an interview with U.S. President Barack Obama broadcast by DawnNews TV. The interview taped Friday at the White House was scheduled for broadcast on Sunday by DawnNews, which is Pakistan's first 24-hour English-language news channel. According to DawnNews, it was the first time a U.S. president granted a one-on-one interview to a Pakistani media outlet. According to the interview posted on the DawnNews Web site, Obama called the huge street demonstrations in Iran a sign that the election results ""obviously raised a lot of doubts." "We respect Iran's sovereignty, but we also are witnessing peaceful demonstrations, people expressing themselves, and I stand for that universal principle that people should have a voice in their own lives and their own destiny," Obama said, according to Web site report. "And I hope that the international community recognizes that we need to stand behind peaceful protests and be opposed to violence or repression." Asked about his June 4 speech in Cairo to the Muslim world, Obama called it a first step in the process of improving U.S. relations with Muslim countries. "What we want to do is just begin to open up a dialogue around which we can constructively work together to deal with significant issues," he said, according to the DawnNews Web site. All parties must do what they can to help relations progress, the president said. Obama said he supports the Pakistani government offensive against Taliban militants in the Swat Valley, but emphasized that was a decision by Pakistan alone. The United States has no plans to send troops into Pakistan as part of its military campaign in Afghanistan, he said, according to the DawnNews Web site. "What the United States believes ... is that we are a partner in the process of peace-loving nations seeking to root out extremism, increase development, and that is the kind of role that we want to play with Pakistan," he said. On the India-Pakistan dispute, Obama said both countries would prosper if their differences were resolved, according to the DawnNews Web site. "We want to be helpful in that process, but I don't think it's appropriate for us to be the mediators in that process," he said.